NEWPORT, Wales -- Kicked out of power nine months earlier, Winston Churchill's vision was still clear when he warned of the "iron curtain" that divided Europe with the emergence of the postwar Soviet empire. Warsaw Pact on the right of your map, democracies on your left. The phrase stuck. So, is the curtain back now? For one thing, this one's not made of iron; in fact, it's downright mushy in the middle. For another, the Soviet empire is history. One thing hasn't changed though: The line still runs to the west of Ukraine. Having lunged to cross to the western side, it seems Ukraine is still on the eastern one. You don't have to be a Churchill to see what's been happening — certainly not after the NATO summit in Wales this week. Simply put, the Western allies are more than happy to make speeches about how very resolute they are — Churchillian, even — in defence of Ukraine. What they won't do is actually go to war for Ukraine. In the Kremlin, Russian President Vladimir Putin must have seen this coming as soon as he bit off Crimea — and then heard the democracies deplore, and condemn, and call it "unacceptable." In practice, though, they accepted it. "Stop! Or I'll shout 'stop' again!" In truth, the allies did much more in Wales than shout, "stop." They pledged loyalty to the Ukrainian cause. They pressed cheques into Ukrainian President Petro Poroshenko's hand and offered joint military exercises. Thirteen Canadian soldiers will participate! HMCS Toronto will go to the Black Sea! And NATO as a whole is offering 15 million Euros to help with logistics, communications and cybersecurity. But there's nothing there about bullets. There will be no NATO bombing campaign, and no war with Russia unless it's fought by Ukrainians. At least, now, they can order their troops to run for their lives on modern radios paid for by their steadfast friends in the West. Canada, in addition to millions already promised, has pledged $1 million to help with communications gear for the Ukrainian army. Oh, and $3 million for the much smaller Baltic states. Four CF-18s are flying patrols out of Lithuania. The Baltic states, after all, are members of NATO. Ukraine isn't — although it wants to be. So we can see where the new, mushy line is: Poland and the Baltic states are on "our" side of it; Ukraine — sorry! — is on the Russian side. Officially, of course, this is not the NATO version of the story. 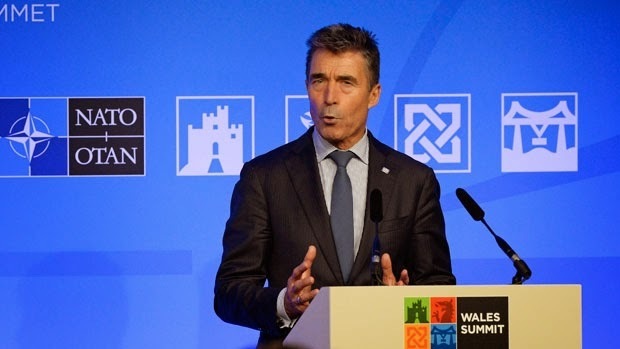 Chairing the summit, NATO Secretary General Anders Fogh Rasmussen insisted that, "our meeting sends a clear message that NATO stands with Ukraine." There's no doubt that he meant it and that the allies meant it. They do, indeed, stand for freedom and democracy in Ukraine and everywhere else. Many of the allies, including Canada, have only recently paid dearly to try and foster freedom in Afghanistan. They made it a better place, too. But it's no use denying that Afghanistan made everyone wary about wading into complicated problems. Asked by an anxious Ukrainian reporter how on earth Ukraine could break free of Russia's grip without military intervention, Rasmussen hastened to say that "no one wants war" and that "a political solution" would be best. And yet, by Rasmussen's own account, the Russians have merely been pretending to hope for a political settlement as a "smokescreen" to cover further predations in Ukraine. Meanwhile, Ukraine is not getting what it wants: membership in NATO and, thereby, protection under NATO's doctrine of collective defense. Ukraine's just not in the club. Now — where will the new line be, exactly, as it crosses Ukraine? How much of Ukraine can the Russians bite off? Officially, the answer from the NATO alliance is, none! Unofficially — we don't know yet. We'd need a Churchill to see that.